(a) Using SST and a hammer, release the staked part of the rear axle shaft nut. Loosen the staked part of the nut completely, otherwise the threads of the drive shaft may be damaged. 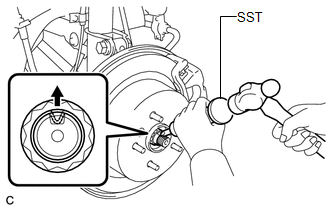 (b) While applying the brakes, remove the rear axle shaft nut. 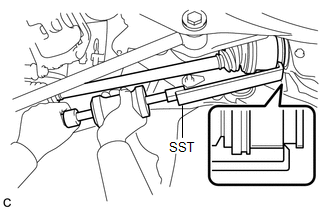 (a) Using SST, remove the rear drive shaft assembly as shown in the illustration. Remove the rear drive shaft assembly while keeping it level.